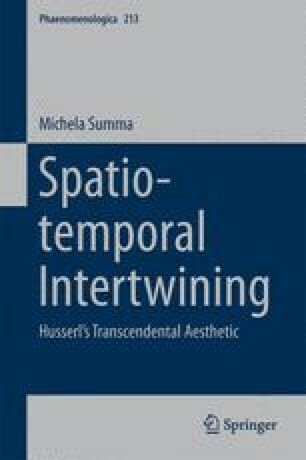 This chapter shows how the intertwining of spatiality and temporality is implied in one of the central phenomena of sensible experience, namely the constitution of things in and through their perspectival givenness. In the first section of the chapter, the meaning of the a priori law of perspectival givenness with respect to both spatial and temporal constitution is discussed. In the second section, the implications of this phenomenon concerning the structure of intentionality and its being animated by a constant tendency toward fulfillment are drawn. This allows us to further elucidate how the spatio-temporal intertwining grounds the dynamic unfolding of subjective experience. In the third section, the nexus between perspectival givenness and the different forms of teleology in spatio-temporal experience is thematized. This articulated analysis provides further arguments for the description of the open, dynamic, and relational nature of sensible experience. Such a dynamics reverberates on the understanding of intentional consciousness, which lends itself to be described as “movement” and “life”.